Two monks were washing their bowls in the river when they noticed a scorpion that was drowning. One monk immediately scooped it up and set it upon the bank. In the process he was stung. He went back to washing his bowl and again the scorpion fell in. The monk saved the scorpion and was again stung. These six words–“please heal my fear-based thoughts”– change lives. 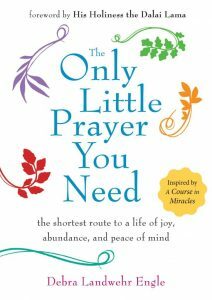 In this brief and inspiring book, based on Engle’s study of “A Course in Miracles,” she explains how to use the prayer and experience immediate benefits such as being less irritable, more patient, laughing more, feeling like you have more time, experiencing more energy, worrying less, making decisions more easily and saying no without guilt. A typical prayer goes something like this: “Please help us find the money to pay our mortgage this month.” Saying the prayer may help you feel like the burden of that month’s mortgage has been lifted, but the part of you that feeds on fear will simply seek out new financial worries to keep you awake at night. Old patterns remain intact. In contrast, asking, “Please heal my fear-based thoughts about our mortgage” lifts the burden AND relieves the need to re-create that fear and hold onto it. This prayer heals your very desire for burdens, your addiction to fear-based thoughts, freeing you to live without that fear and with greater peace of mind. Has your family gone through the same trials and tribulations generation after generation? Do you feel fated to continue that trend? If so, it’s possible you’ve inherited the karma of your family members. The good news is that you can break the cycle. Renowned author, soul healer, and shamanic practitioner Dr. Steven Farmer shows you how to not only free yourself from negative cycles of the past but also access the ancient wisdom of your ancestors. In Healing Ancestral Karma you’ll learn how to: make contact with your ancestors; heal hereditary traits and characteristics that have compromised your physical, emotional and mental health; incorporate your ancestors’ wisdom into your spiritual path; clear karmic baggage so your descendants inherit only positive karma; imagine how different life could be if you had access to the wisdom of all those who’ve come before you. “Healing Ancestral Karma” shows you how. No matter what your current spiritual philosophy or practice, you can have a relationship with your ancestors and gain guidance, knowledge and healing.